Can The Track-Ready Audi SQ5 Go Off-Road Like A Normal SUV? Better yet, can any "sports SUV" get its fenders dirty without breaking down? Richard Hammond famously proves that the Land Rover Range Rover Sport SVR really lives up to the dual nature that the hardware on its Monroney sticker claims by nearly submerging it in a pond during an off-road challenge and later taking it to the race track, where it beats the Mini Cooper JCW. This isn’t exactly the same sort of test, but Roman Mica of The Fast Lane Car does what he can to prove the dual nature of the SQ5 while under the watchful eye of Audi. 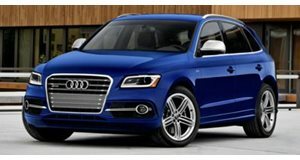 With the same 3.0-liter V6 as the Audi S4, the SQ5 makes a respectable 354 horsepower and 369 lb-ft of torque, enabling the crossover to launch from 0-60 mph in only 5.1 seconds. To expect more performance is to miss the point entirely because this comfortable highway cruiser has the handling of a much sportier car. Under the pretty sheet metal is an upgraded brake kit, sport-tuned suspension, and 20-inch tires wrapped in all-season performance rubber. The exterior looks nice too, though the fake exhaust pipes put in by Audi make us cringe, roll up in a fetal position, and open up a new browser tab to look for custom exhaust systems before we’re ready to confront the world again. To make up for it, Audi has installed an adjustable suspension that can raise the car when the pavement runs out. You may want to drive delicately on those pizza dish rims, but at least it’s nice to know this Audi can handle more bad terrain than its S4 cousin.